The National Highway Traffic Safety Administration (NHTSA) has declared the week of September 19 through 25, 2010 as Child Passenger Safety Week, and Saturday, September 25 as National Seat Check Saturday. According to NHTSA, the leading cause of death of children between the ages 3 to 14 is car accidents. 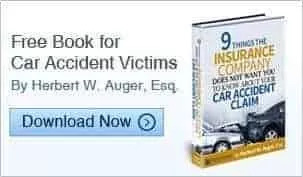 The car accident attorneys of Auger & Auger want your children to be safe and encourage you to bring your vehicle, car seat, and child for a child safety seat inspection by a certified technician. If your child’s car seat is improperly installed, the technician will demonstrate the proper way to install and use it. NHTSA has also found that when properly used, child safety seats decrease fatalities in children under 1 year old by 71%, and 54% in children between the ages of 1 through 4. For more information on which restraint is appropriate for your child, click here. Of the 45 children that died as the result of a car accident in North Carolina in 2008, more than half (25) were between the ages 8 through 14. North Carolina law requires all vehicle passengers under the age of 16 to wear a seatbelt, regardless of where they are sitting in the vehicle. In spite of a decrease in the number of car accidents in Charlotte, North Carolina and the fewest number of wrecks in the last 10 years, the number of people dying in motorcycle accidents in North Carolina has increased by 20%. In effort to keep riders safe, Charlotte area motorcycle dealers, as well as those across the state, provide driver-safety training classes. Notwithstanding the availability of these safety training opportunities, the State of North Carolina does not require motorcycle riders to participate in such training before hitting the road, and does not even require a road test! In fact, those wishing to drive a motorcycle need only to pass a vision test and a written test in order to obtain an 18 month permit, which can then be renewed indefinitely. Why the increase in motorcycle deaths? According to AAA Carolinas, inexperience and lack of safety training has lead to the growth in motorcycle deaths. The poor economy is also to blame, with more drivers opting to drive motorcycles, scooters, or mopeds in effort to save gas. For those without a valid North Carolina drivers’ license, the State of North Carolina allows a moped to be driven without inspection, registration, or drivers license. Lack of licensing and alcohol consumption are big factors in motorcycle fatalities. A 2008 study by the National Highway Traffic Safety Administraction (NHTSA) found that 25% of the motorcyclists killed lacked a valid license, and that bikers involved in deadly collisions were 1.4 times more likely to have had a prior license suspension or revocation than operators of passenger vehicles. Similarly, more bikers in fatal collisions were found to have been driving under the influence than drivers of passenger vehicles in fatal collisions. NHTSA reports that 29% of motorcyclists involved in fatal accidents had a blood alcohol level of .08 or higher, compared with 23% of passenger car operators. Motorcycle operators involved in fatal collisions were also more likely to have prior conviction for speeding and DWI than operators of passenger vehicles involved in fatal collisions. Another reason for the increase in motorcycle deaths is the surge in popularity of high-performance motorcycles. The Insurance Institute for Highway Safety (IIHS) reports that the death rate for riders of supersport motorcycles is almost 4 times higher than the death rate for all other types of motorcycle. In 2005, the IIHS found the death rate of supersport operators to be 22.5 per 10,000 registered motorcycles, compared with a death rate of 5.7 deaths per 10,000 registered motorcycles for cruisers and standard motorcycles. High performance motorcycles account for less than 10 percent of all registered motorcycles, yet more than 25% of motorcycle deaths are for riders of these supersport motorcycles. As one would expect, speed and driver error were cited as the largest contributing factors in fatal accidents involving these high performance bikes. From August 20, 2010 thru September 6, 2010, the North Carolina Department of Transportation (NCDOT), through the Governor’s Highway Safety Program, implemented a program called “Booze It & Lose It.” During the labor day weekend, local police and state highway patrol arrested 3,297 drivers for driving while impaired. Mecklenburg County lead the way with 286 arrests for driving while impaired, followed by Wake County (215) and Robeson County (177). During this program, 1,100 fugitives from justice were apprehended, and 113 stolen vehicles were recovered. Other violations during this time frame included 2,163 drug charges and 32,635 speeding violations. The Charlotte Department of Transportation (CDOT) recently issued its annual report on car crashes. The study found that there were 16,648 car accidents in Charlotte in the last year. This is the lowest number of reported collisions in Charlotte since 2000. The study found the rate of pedestrian related crashes to remain relatively steady with 4.3 crashes per 10,000 people living in Charlotte, compared to 4.6 crashes per 10,000 people in 2000. The rate of bike wrecks, however, declined from 2.13 bicycle crashes per 10,000 population in 2000, down to 1.2 crashes per 10,000 population in 2009. City officials were unable to identify a reason for the decline in Charlotte, North Carolina car accidents. It is interesting to note, however, that the study was based on the number of crashes as compared to population, rather than the number of crashes compared to actual miles driven. In other words, the study does not take into consideration whether, assuming the same population, people are driving less than in previous studies. Regardless of the reason for the decline in Charlotte, North Carolina car accidents, the trend in Charlotte mirrors the trend in the rest of North Carolina, as well as the rest of the United States. Our Charlotte North Carolina car accident attorneys continue to remind drivers to drive defensively and always wear seatbelts. The National Highway Traffic Safety Administration (NHTSA) just released its finding on motor vehicle accidents that occurred in 2009. According to their study, traffic deaths in 2009 were at their lowest rate since 1950. Despite an increase over 2008 in the estimated miles driven annually, traffic related fatalities in 2009 were 1.13 deaths per 100 million miles driven compared to 1.26 deaths per 100 million miles driven in 2008. Even motorcycle deaths were down, following an 11 year stretch of increasing every year. In North Carolina, total traffic fatalities in 2009 decreased by 8% from 2008, and alcohol related fatalities dropped 14% from 2008. Alcohol related traffic fatalities in North Carolina represented 28% of all traffic fatalities in 2009, compared to 30% in 2008. The national average was a 9.7% decrease in total traffic fatalities from 2008 to 2009, and a 7.4% decrease in alcohol related traffic fatalities. Despite the decrease in highway deaths, seatbelt use is still too low. The study found that of all traffic related deaths in 2009, more than half (53%) of the decedents were not wearing seatbelts. The study did not address whether those unrestrained victims would have survived had they been properly restrained. Our Charlotte, North Carolina personal injury law firm cannot stress enough the importance of wearing your seatbelt and properly restraining young children. Countless lives can be saved with the simple act of buckling up. With Labor Day weekend starting today, our Charlotte, North Carolina car accident lawyers ask that you take extra care in your travels this weekend. North Carolina State Highway Patrol (NCHP) and local police, as well as South Carolina State Highway Patrol (SCHP) will be on the lookout this weekend for speeding drivers and drunk drivers. NCHP is running its annual “Booze It & Lose It” campaign this weekend. Check points will be set up at various locations throughout the state looking for impaired drivers. In its 2009 “Booze It & Lose It” campaign, over 100,000 traffic and criminal citations were issued over the labor day weekend. Similarly, SCHP is concluding its “100 Deadly Days of Summer” campaign this weekend with extra patrols on the state’s roadways looking for drunk drivers and speeders. To date, there have been 177 vehicular deaths since the “100 Deadly Days of summer” began, which is down considerably from last year’s 255 deaths during the same time frame. SCHP attributes these deaths to DUI, speeding and reckless driving.